You will love this unique and delicious blend of premium chunk light tuna with whole grain rice, black pearl barley, daikon radish seeds, beans, carrots, and corn — all perfectly seasoned with spicy red peppers for a BOLD kick. 7 grams of protein and 110 calories per single-serve pouch provide a smart (and spicy!) boost of protein to enjoy in any salad, wrap, or right from the pouch. Packed in our no-drain, flavor fresh pouch, it’s easy to take anywhere and eat anytime. 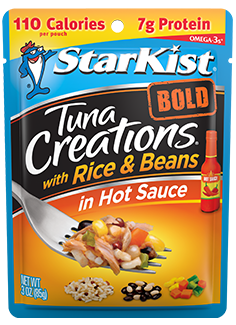 ++ Tuna Creations® BOLD with Rice & Beans in Hot Sauce contains 85mg of EPA and DHA omega-3s per pouch combined.